Above - Eyewear Gallery in our Simcoe office. 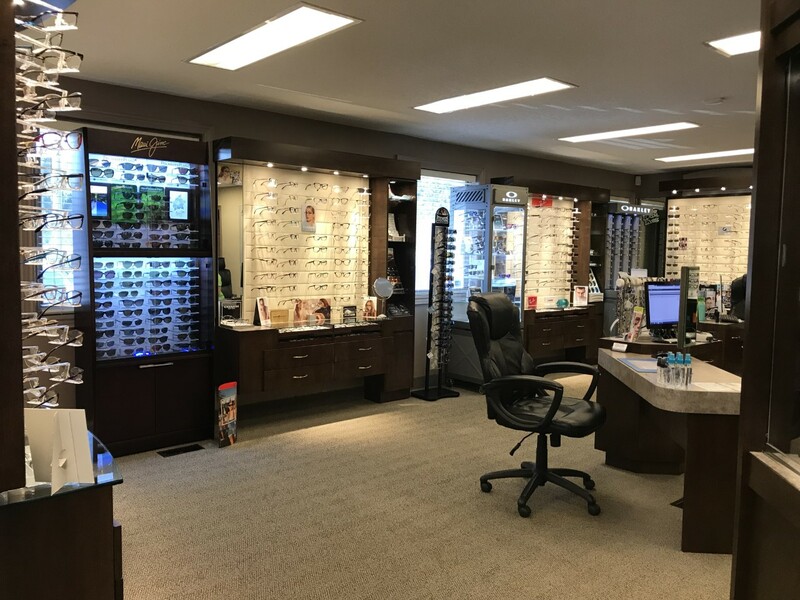 At Norfolk Family Eye Care, our Eyewear Galleries offer a variety of quality spectacle frames, designer sunglasses, safety eyewear, and accessories. Both our Simcoe and Port Dover locations each have their own unique selection of eyewear offering over 1600 choices including Oakley, RayBan, Maui Jim as well as many of the top designers in the fashion industry such as Tiffany & Co., Kate Spade, Michael Kors, Dolce & Gabbana, Burberry, Carrera, Silhouette and many more. We also offer a variety of safety glasses for occupation or sport. Our Certified Optometric Assistants are expertly trained to recommend frames that are best suited to your facial features, size, prescription, leisure activities and lifestyle needs. A lifetime of no charge frame adjustments are included with the purchase of your eyewear. Norfolk Family Eye Care stands by our products with a 90 day Vision Guarantee. If for any reason you are not satisfied with you purchase within 90 days we will make changes to fix it. Like most people, you probably own more than one pair of shoes for different situations in life. The same applies for glasses. Life has too much to offer to see it through only one pair of lenses. Occupation, leisure time activities and fashion preferences are all good reasons to own multiple pairs of eyewear. Please ask about our big BOGO deals today! Glasses say so much about your personality and personal style. At Norfolk Family Eye Care, we are happy to work with you in selecting frames that complement your features. Our experienced optometry professionals work closely with you to select the proper frames to fit your budget as well as your cosmetic, lifestyle, and vision needs. While working with our experienced staff enables you to select the appropriate frames, we invite you to learn more about which frame styles complement various face shapes.